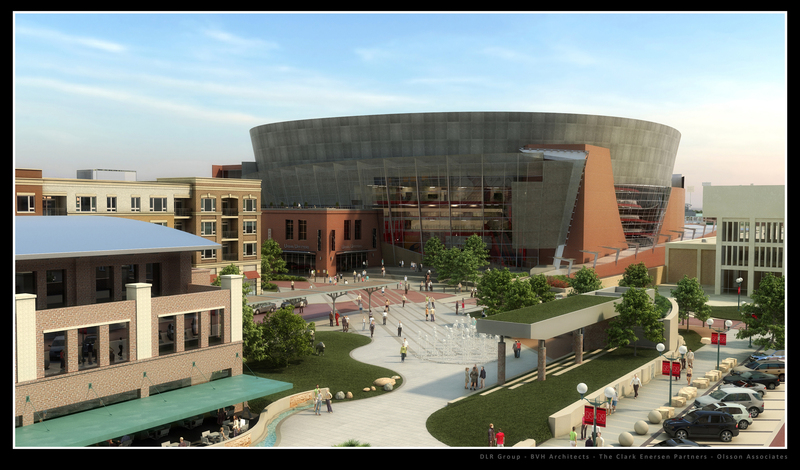 The city has finally released new renderings of what Lincoln’s new arena will look like when it’s complete in (hopefully) 2013. 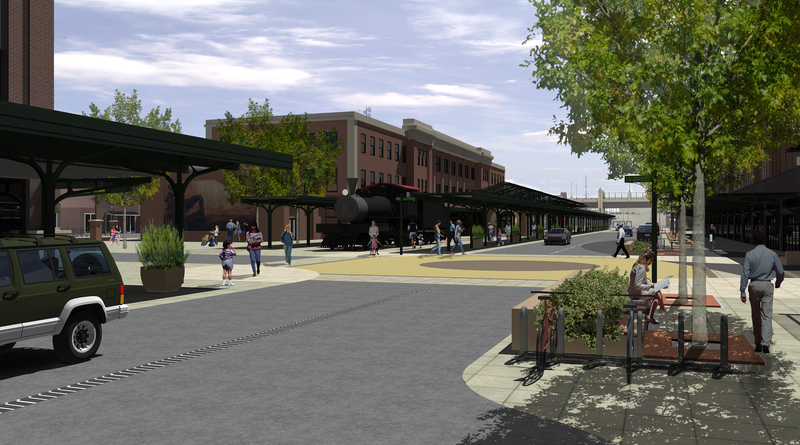 They are not real detailed, but they are different from the renderings that have been public up to now. The arena appears to be a lighter color, but what really jumps out at me is what appears to be a huge picture on the side of the arena apparently depicting a historic picture of the Haymarket. Take a gander and then have at it with your architectural critiques. The city finance director reported Thursday that new hotel, car rental, bar and restaurant taxes being collected for the city’s arena project appear to be coming in as projected. The city of Lincoln began charging the new occupation taxes — which are usually passed on to consumers — in January. The first batch of taxes were due in late February — although bars and restaurants can choose to pay the tax quarterly — and Finance Director Don Herz told the Joint Public Agency that oversees the arena project that the city collected about $743,000. “I’m very comfortable with those numbers,” Herz said. In fact, depending on the final numbers that come in by April, he said the tax revenue “may slightly exceed” the city’s projections. Car rental and hotel businesses are seasonal, he said, and will fluctuate. Speaking of occupation taxes, the Journal Star is reporting that the Legislature is on the verge of taking away the city’s authority to charge occupation taxes on the sale of telecommunications equipment. The city of Lincoln broadened this tax from services to equipment last year, but the Legislature was lobbied heavily by retail groups to rein the city in. Looks like a compromise would allow the city to keep the tax until 2013 — giving the city breathing room for awhile. 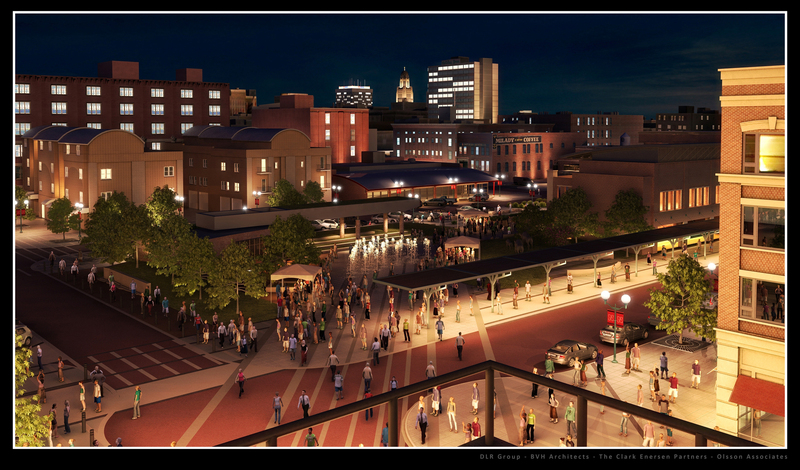 Another company may be added to the list of contractors managing the $340 million arena project Lincoln is embarking upon in a railyard west of the Haymarket. The Joint Public Agency overseeing financing and construction of the project will be asked Thursday to terminate the temporary contract that SAIC Energy, Environment & Infrastructure (formerly Benham Companies) has been working under for about five months and approve a regular contract with SAIC worth $4.4 million that lasts through the fall of 2013. SAIC is the program manager — they coordinate budget controls and progress to make sure the project gets done on time and on budget. Interestingly, the new contract adds a subcontractor called PC Sports of San Antonio, Texas, to serve as project manager for the arena portion. Their contract is worth $913,500 — or $30,450 a month. According to public documents, SAIC will provide PC Sports free office space, document control and support and administrative support. The documents don’t indicate whether this is an increase in the projected budget for program management. PC Sports was founded in 2001 and according to its web site, the company provided project management services for the AT&T Center in San Antonio, the Sprint Center in Kansas City and the KFC Yum! Center (please don’t let us get such a dorky arena name!) in Louisville, Ky. The JPA will consider the new arrangement during its meeting at 9 a.m. on Thursday at city hall, 555 S. 10th St. Sometimes I have to wonder if our elected officials have any idea what they’re doing. 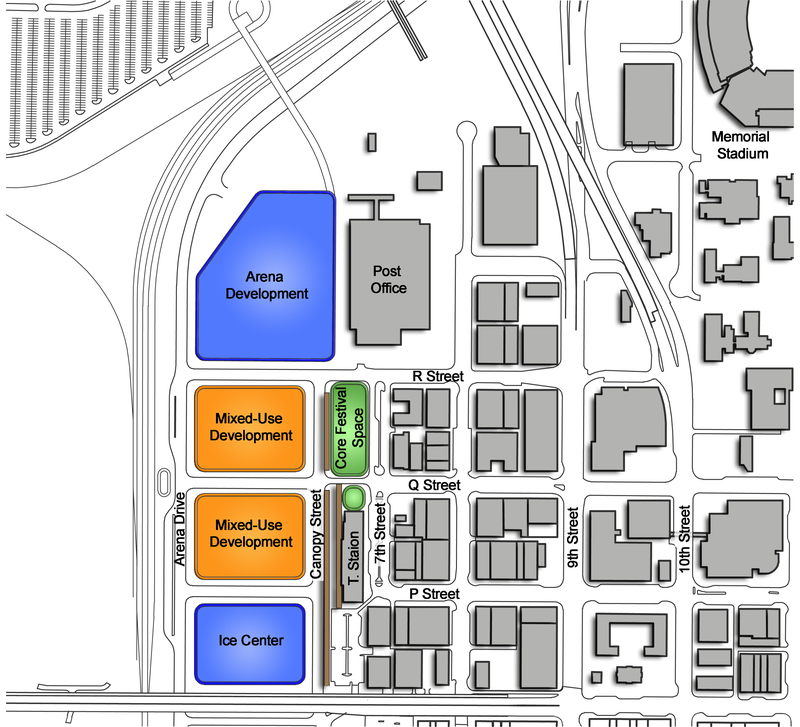 Like yesterday, when the Joint Public Agency (the board overseeing the arena project) met to talk about a pre-construction agreement with their general contractor, Mortenson Construction. Although the city had advertised for a contractor that would use the city’s open, transparent bid process to choose subcontractors, the pre-construction agreement approved by the JPA just obliterated that promise. It will allow Mortenson to choose subcontractors to do mechanical electrical and plumbing, structural steel, precast concrete, concrete, exterior walls and vertical transportation. I wrote a story Tuesday about how the agreement makes a mockery of the promises Mayor Chris Beutler has been making about how the project will be done with complete transparency and accountability. The Journal Star wrote about it the next day. Then the JPA met to consider the agreement – and was completely snowed. Even LIBA couldn’t convince them to slow down, take a week to mull it over, reconsider whether bids should be opened privately. Nope – they plowed forward, driving blindly. Understand, the JPA is comprised of Beutler (whose staff wrote up this deal), Councilwoman Jayne Snyder (who rarely deviates from Beutler’s agenda) and University of Nebraska Regent Tim Clare (our only hope to ask the right questions). Clare opened the discussion by saying they’ve come up with an amendment that should address concerns about transparency. Which would be great – if only it were true. The only relevant change seemed to be that a JPA member or designee would be able to observe the discussions and interviews with bidders. How is that going to work? Will a JPA representative be hanging out with Mortenson from here on out? Listening in on their conversations and negotiations? Impossible. Also, bid scorecards would be made public. The way I understood it, the scorecards were already going to be made public. Seeing scorecards is not the same as seeing what the bids were. Something is pushing the city to go along with Mortenson’s more private way of doing things – even though Mortenson got sued for this very type of keep-everything-a-secret process in Kentucky. And even though Beutler has repeatedly said this will be the most transparent, open process the city has ever seen. Within a week, he was retreating from that position. Now he’s completely forgotten it. Who is holding this guy’s feet to the fire? Clare tried, but failed. And he’s the one guy whose vote could stop everything, according to their bylaws. John Wood, senior vice president of Mortenson Construction, attended the JPA meeting, and buttered ’em up good. Even though it appears Mortenson is abandoning the promise it made when it put in its proposal to use the city’s open, transparent bidding process, he basically said they have to alter that to get the project on time and on budget. To his credit, Clare asked some good questions, like whether Mortenson would just hire their non-local “friends” to do work. To his credit, Wood acknowledged many regional and national firms are interested in getting a piece of arena work – including firms they’ve worked with before. Wood said those firms have been advised to hook up with Lincoln businesses. Wood said Mortenson is willing to use the city’s eBid procurement system, but did not elaborate. It still appears the eBid will only be used to “receive” bids, which will be opened privately. Mayor Beutler commented that he thinks some citizens don’t understand the city is using the construction manager at risk method to build the arena – which is different from the usual design-bid-build method the city uses to build streets and bridges. Which was irrelevant – that method doesn’t require bids to be so secretive. The upshot is that Wood made everything sound peachy, the JPA board bought it, and nothing substantially changed.